In times of crisis such wildfires, the key to saving lives and protecting property is effective incident management. Having adequate numbers of first responders ready to head bravely into the fire and plenty of equipment on hand does little to help the situation if you aren’t able to bring those resources to use when and where they are needed. A process called the Incident Command System (ICS) and a well-equipped mobile command center can make all the difference in these situations. In the 1970s, a series of devastating wildfires in California prompted CAL FIRE to develop an approach to communications and operations that made responsibilities and areas of authority very clear to all the people involved in an emergency response. Over the years, ICS has spread to agencies across the country and in the process, has been fine-tuned to maximize its effectiveness. Command - People in the command group authorize and oversee the actions of everyone involved in responding to the incident. Operations - The operations group represents the people on the front lines performing the actions needed to manage the incident. Planning - Planners create the strategy for handling an emergency. Logistics - The logistics group ensures that the operations group (and others) have everything they need to be effective. Finance/Administration - This group manages the funds needed to pay for the emergency response. This approach has been so successful over the years that it has been adopted in other areas like healthcare and business. Underlying the work of all these groups is the infrastructure needed to gather, analyze, and share data. Without timely and accurate information, everyone’s job is more challenging, if not impossible. 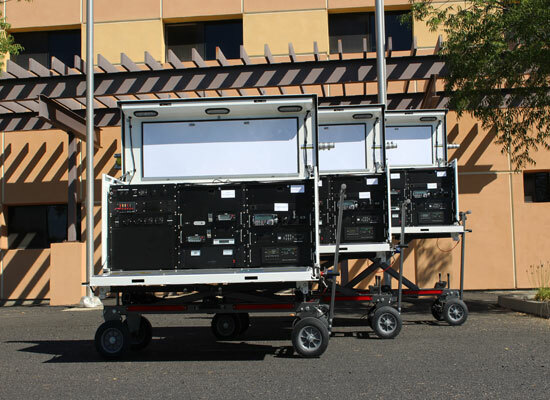 Consequently, a mobile command center is imperative to the success of any emergency management initiative. If you have questions about how the Command-Runner™ system could give you exceptional command and control over a wildfire response or any emergency incident, give us a call today at (888) 427-3728 or email info@ThePodRunner.com.